The hole in which the remains of Mahendra Ghanie called “Azad” were found aback his employer’s home. 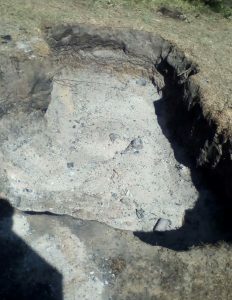 The burnt remains of a man suspected to be those of a missing labourer were Friday afternoon unearthed behind his employer’s home at Number 55 Village, Corentyne. 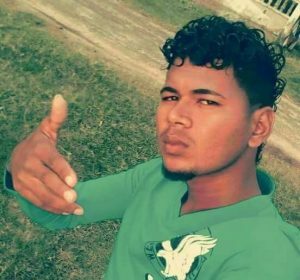 After police earlier reportedly unearthed what were said to be human remains, family members are certain the remains are that of missing laborer, 21-year-old Mahendra Ghanie called “Azad”. Four suspects, including the missing man’s employer, were placed into police custody. The remains were discovered in hole behind his employer’s home at No. 55 village, Corentyne. According to the missing man’s mother, her son left home at around 5 PM on Monday for work. 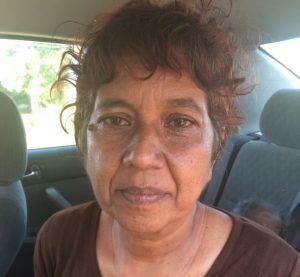 The grieving woman, Indranie Seenarine stated that her son called later in the evening to say that he reached his destination. However, family members began suspecting something was amiss after several calls over the next days went unanswered. “He call Monday and seh mommy me reach. Then now Tuesday we call and he nah answer he phone. So we think he working. But then now Wednesday, we call again and he nah answer and I feel like something happen to meh son”. The missing man’s brother, Razack Ghanie relayed that upon reaching the scene, they saw the main suspect’s son who immediately fled after spotting them. “The man son run away soon as he see we come and we go back and tell the police all this but they ain’t come back with we to search or nothing”. and so we search bout ah hour then we see this hole next to pile ah ash. And me tek a stick and juk juk in the hole and find like about five piece ah bone inside”. Mahendra Ghanie resided in Bloomfield with his mother, two sisters and one brother. Police are continuing the investigation.